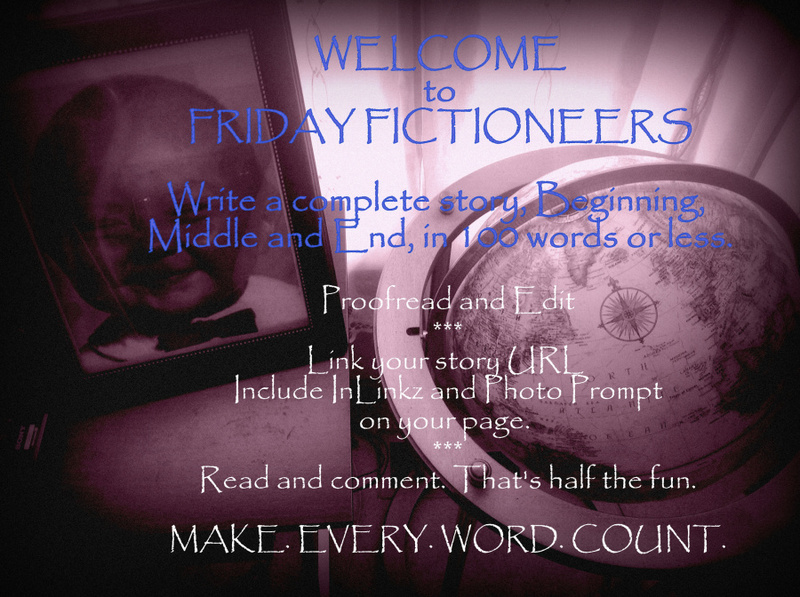 This is my entry for this week’s Friday Fictioneers Challenge run by Rochelle Wisoff-Fields. This week’s picture prompt was provided by David Stewart. The challenge is to write a story within 100 words. Edward watched enviously from the shadows, listening to the music emanating from the pavilion. The community band had consumed his whole life: every spare minute for years spent arranging music and preparing sets, his whole identity built around his role. Now that had been stripped away. He knew he’d been a hard task-master, organising frequent rehearsals and driving them hard. It was still painful to see them moving on with his youthful replacement. At least he could still listen to them play. Had the heart attack taken him in any other place he would be unable to do even that. Click the little blue frog to see other entries or to add your own. It’s hard to hand over the reins after so long, but it sounds like someone in the band or audience was able to help save his life. That’s the hazard of not looking at other people’s stories before I post my own – I would have given it a different title if I’d known! Are you sure someone managed to save him? I did leave it quite open to interpretation…. I just took another look and saw it from the point of view of a ghost stuck haunting a single location. Very cool! It must be difficult to let go of something so dear, especially if it was once the reason behind your existence and purpose in life. Poor Edward 😦 I had some mixed emotions when I read this. 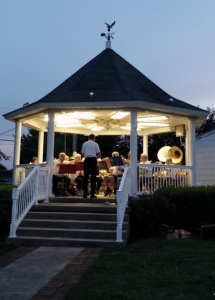 His connection to the music and the community band was so strong that that’s the place he went to after he died and I felt happy about that. But then I had the feeling that Edward was kind of a jerk when he was alive so I didn’t feel quite as happy for him! He was very driven to make the band the best it could possibly be and he didn’t always think about other people in his determination to make it so. 🙂 Thanks for reading! Well, it looks like he died in a place he loved… Great story! Yes a very sobering thought Louise. Well done. That is touching! I am thinking it is his spirit there by the bandstand! You could be right. 🙂 Thanks for visiting! It is not easy to move on! Though weary, the person hates to hand over his life to someone else. Good one. I like the way you left whether the man was alive or dead to interpretation…works for those who don’t beleive in ghosts 🙂 . Nice one! I had to read it twice just to confirm what I “thought” I read the first time around. I understood it that the heart attack killed him but left him where he was most familiar. Very nice Louise!! Thank you. I actually left it quite open to interpretation – you can read it that he’s dead and haunting the bandstand or you can read it that he survived but was forced to retire. 🙂 I’m glad you enjoyed it! edward must learn to look on the bright side. now he’s free to pursue something new. woo-hoo! He is. 🙂 Thanks for visiting! To be a passive bystander can be hard.. But at least he could hear them.. Sad tale about transitions and codas. At least he can still hear the music. Well imagined and written. It would be difficult to be a mere bystander after so many years of pouring his heart and soul into the band. Nicely played. One’s life work is hard to let go of–and so is music–I can understand this person’s feelings! My interpretation of the story is that he died, which is sad as it would have been so much better for him to have departed this world doing what he loved most, like Louis Vierne, the blind French organist who died of a heart attack during his 1750th organ recital at Notre-Dame de Paris on 2 June 1937. Your story illustrates so well that people who don’t learn to let go, die bitter. I have to admit that, as a singer, I find it really hard listening to other people singing when I get a sore throat and lose my voice, but I’d never get as screwed up as Edward about it! It would be hard to move on, especially after what sounds like and unwilling resignation…I read this and it put me in mind of Angie Sage’s Septimus Heap books – the ghosts there have to remain in the spot they died for a year and a day before being able to move on…maybe that’s the case with this bitter chap. Fitting the band should lead him out. You could be right. 🙂 Thanks for visiting. Always a fan of ghost stories, this one doesn’t disappoint. I like the idea Ed is bound to the spot of his death, although it makes me terrified of dying at work one day! Your story reminded me of a movie Whiplash. Very insightful piece, we see Edward’s life in a flash. I’ve just googled Whiplash – it looks like an interesting film. 🙂 Thanks for visiting. Awww poor Edward. Great story!